Alright, this was the last late night hockey on Wednesday for awhile. Apparently, Brit will be off limits during the Olympics. So, I really needed to make our post-hockey meal count. 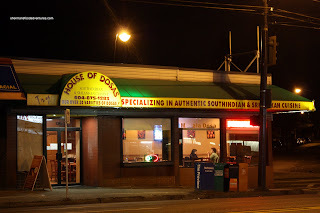 Seeing how Kim had mentioned that House of Dosas is now open 24 hours, it looked like a good bet. It's definitely something different, especially in a sea of Northern Indian cuisine. You see, most of what you see as "Indian" food is actually from the Punjab. 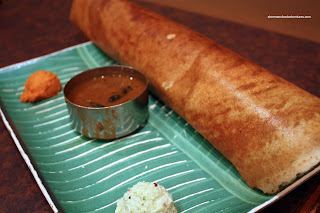 Dosas are representative of Southern Indian cuisine. Made of lentil flour, these "crepes" are often filled with potato, paneer and curries. Initially, I was a bit weary of heading over to House of Dosas for late night eats. Hey, it can be quite spicy, depending on the filling. Probably not the best idea just before bedtime. Whatever the case, I was willing to take the chance. I ended up getting the Lamb Dosa. Nothing particularly interesting with that choice except for the fact I asked for it to be spicy. When I mean spicy, I mean "burning in your mouth, on your tongue, down your esophagus, warm-in-your-tummy hot". While eating it, I had to resist drinking any water. While trying to rest my mouth, I was able to enjoy the thin, crispy dosa. Served on the side was Sambar and the usual chutneys - coconut and spicy tomato. Yes, this is a great place to try one. I think they're cheaper on Mondays @ $5.99. i like this place but i think it's too small. when i went it was really busy and we were far too close to the neighbours. maybe i should go at 2am? You may want to try the veg dosa next-time. south indian cuisine is famous for vegetarian & fish dishes. i particularly liked the 'alu-gobi' & 'prawn/fish curry' items when i visited south india. 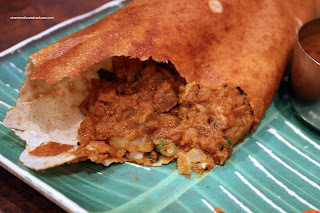 i have to try House of Dosa soon & see if they are as good!